Actress #SonaliBendre, who is currently in New York battling cancer, shared a heartwarming post on her social media profile, wishing everyone on #GaneshChaturthi and her longing for home. 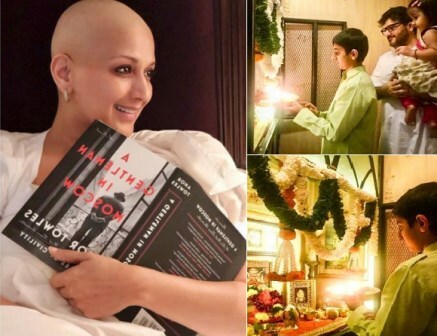 Sonali Bendre took to her social media profile and shared a picture of her family performing the Ganesh Puja and expressed that she is missing being there with her family during the festival as it is one very close to her heart but nonetheless, she feels blessed. Her post read, "Ganesh Chaturthi has always been very, very close to my heart. Missing the celebrations back home, but still feeling blessed. Have a happy one, filled with blessings, love, and joy." Sonali was diagnosed with cancer in July this year. She broke the news on social media in a post. Recently Sonali Bendre shared a post on her social media, where she shared a picture of her ‘new look’ wearing a wig. The actor wrote a post about how she still wants to look good and thanked Priyanka Chopra for attaining her new look. Actress Sonali Bendre is under treatment for Cancer. Due to chemo and other radiation treatment, the actress has lost her hair but thanks to Priyanka Chopra, now the actress has a new look and she shared a video on her social media account.